Lorraine: In this feature interview segment from Show 3, I speak with citizen advocate Joan Treppa and also Joan Van Houten, the daughter of a wrongfully convicted man; both Joans are contributing in their own ways to The Voice of Innocence groups as well as The Reporters Inc’s forthcoming documentary, The Innocent Convicts. 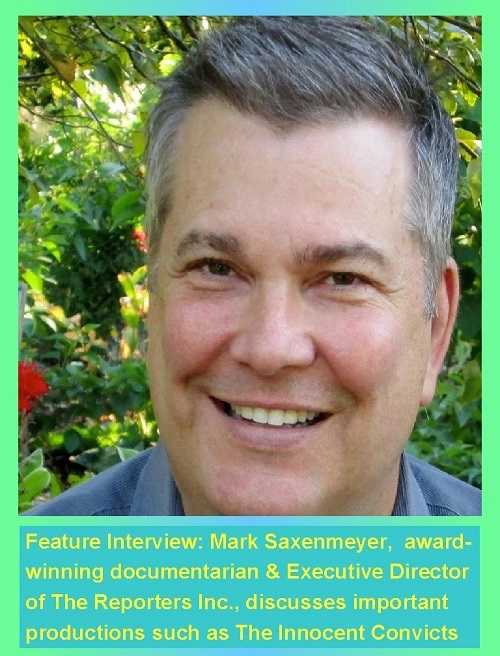 Documentary filmmaker Mark Saxenmeyer, executive director of The Reporters Inc. discusses important productions such as The Innocent Convicts. In the past Mark has worked for the Fox network and KSTP-ABC TV, and among his and his team’s many awards is a national Emmy for The Reporters Inc. documentary, The Experiment in Black and White. Welcome to this month’s edition of The Hollywood Trivia Closet featuring Celebrity UFO encounters on The Ultimate Movies Broadcast Show 2. And one of the most sensational encounters may or may not be true. Famous people seeing UFOs include those in the news, and some who even reported the news. Walter Cronkite never publicly admitted to his UFO experience about witnessing, along with other reporters, an alien spacecraft blow up a U.S. military test missile. According to UFOologist Bill Knell, when he was interviewed by Walter Cronkite in 1973 for a planned CBS UFO documentary, Cronkite turned the tables and told Knell what had happened to him in the 1950s. Apparently Cronkite and the others had been taken to a South Pacific island to watch a new Air Force missile test. He told Knell that photos, audio transmissions or recordings by the press were forbidden. Only hand-jotted notes would be allowed. While reporters scribbled away, just as the missile fired-up, a large disc-shaped UFO appeared. Cronkite estimated that the strange grey object was about 50 feet in diameter and had no smoke or vapour trail, so how it was propelled was a mystery. He also couldn’t determine if the UFO made any sound. Air Force guards ran toward the UFO with dogs as the disc hovered 30 feet above. Suddenly the UFO blasted out a blue beam of light, which struck the missile while it took off, a guard and a dog all at once. Cronkite was shocked to see the missile freeze in mid-air, a guard was frozen in mid-step and a dog froze in mid-air as it jumped at the UFO. And then – the test missile exploded! And the UFO vanished. The guard and dog were taken away by medical personnel. Other guards guided the reporters into a concrete observation bunker. About thirty minutes later they were escorted back to the missile site. Other celebrities to witness UFO sitings include actor Russell Crowe, claiming he had once seen spaceships fly past his Woolloomooloo, Australia office while trying to film fruit bats in his garden with a Canon 5-D camera. UFOs sped by as glowing red streaks of light, moving left to right. Crowe posted his sighting online, however, most viewers were skeptical. In 1974 in New York, John Lennon saw a cone-shaped disc emitting red light near the horizon. When it seemed to fly in his direction, he called for assistant May Pang. They watched the craft a few moments before it flew off. Lennon estimated that the UFO was the size of a Lear jet. It returned later that same day, with “a row or circle of white lights that ran around the entire rim of the craft.” The local newspaper ran the story, informing Lennon that at least 7 other people reported seeing it around the same time. Lennon later drew the sighting for the cover of his Walls and Bridges LP. Buzz Aldrin, the second man on the moon, appeared in a 3.5 minute segment of a documentary titled “First on The Moon: The Untold Story” that recorded the entire crew of Apollo 11 on their way to the moon. Aldrin commented, “There was something out there that, uh, was close enough to be observed and what could it be?” The astronaut later described a “singed object,” with an L-shape, and that Mike Collins had also seen the craft. At the time, the crew was too nervous to report the sighting to Mission Control. Aldrin also explained after the fact that, “we decided that after a while of watching it, it was time to go to sleep and not talk about it anymore.” The incident was never officially acknowledged by NASA. Dan Akroyd has believed in UFOs for years, and is a member of the Mutual UFO Network or MUFON, serving as the official “Hollywood” consultant. Aykroyd developed a documentary about UFO encounters, and was also host of the series, PSI Factor: Chronicles of the Paranormal. In the late 1980s, Aykroyd once woke up in the middle of the night, saying, “they’re calling me, I want to go outside,” but remained in bed. The next day the media received countless reports from upstate NY, Quebec and Vermont, of other people having the urge to go outside at three in the morning. Those who did witnessed a strange massive pink spiral above the great lakes. Legendary boxer Muhammad Ali saw 2 UFOs over New York City when he was younger, working out and training for a fight in Central Park. Longtime friend and trainer, Angelo Dundee, also witnessed the UFOS, describing that the crafts moved slowly over the skyline for about 15 minutes before disappearing. It was later found that several UFO sightings at Newark Airport had been reported. Mick Jagger’s first encounter was at the Glastonbury Music Festival in 1968 when he saw a cigar shaped craft light up the sky. It spooked him enough to install a home UFO detector capable of picking up changes in electromagnetic fields to indicate alien spaceships were nearby. In 1969 he had a second experience while camping. Rolling Stones bandmate, Keith Richards, also claims to have seen UFOs. Entertainer Jackie Gleason was a subscriber to the newsletter Just Cause (Citizens Against UFO Secrecy), and he had a collection of 1700 books on UFOs and the unknown. His Peekskill, N.Y. home which he called ” The Mother ship,” had been designed to be round like a flying saucer. Most of his furniture was round, and the garage, called the “Scout Ship” was also flying saucer-shaped. And was there really a UFO connection between Gleason and President Richard Nixon? Firstly, Nixon had presided over a few historic space-related events during his presidency – President Kennedy’s dream was fulfilled when the first men landed on the moon in July, 1969. Nixon announced the development of the space shuttle in 1972, and plans for a manned exploration of Mars and a program to remotely investigate Saturn. It was in December 1969 during Nixon’s first year in office, that the United States Air Force closed Project Blue Book, ending official U.S. government investigation of UFO phenomena. But it didn’t shut down Nixon’s personal interest in the subject. White House records show that President Richard Nixon met Gleason at the Inverness Golf and Country Club in February 1973, to help the entertainer open a charity golf tournament. They became good friends. Both loved to golf, had high regard for the FBI, and both had large collections of UFO books. Gleason lived in Miami for the last twenty years of his life, and Nixon had a Biscayne Bay residence not far away. Apparently one night in 1973 Nixon showed up at Gleason’s home and they drove in the president’s private car to Homestead Air Force Base. Shortly before his death in 1987, Gleason revealed to Larry Warren, a member of the Air Force Security Police at RAF Bentwaters, that he had seen bodies of aliens at Homestead. Gleason’s second wife, Beverly McKittrick, also later confirmed that Jackie had visited a heavily secured area at the base and viewed the strangest things in a top secret repository. Gleason recounted to Warren that in one section Nixon pointed out flying saucer wreckage in several large cases. They then entered an inner chamber containing perhaps eight units resembling large glass-topped Coke freezers. Inside were remains of what appeared to be children and other figures that looked to be quite old. Singer-actress Olivia Newton-John saw a UFO when she was 15, which sparked a lifelong interest in extra-terrestrials. Former President Jimmy Carter, at the time governor of Georgia, reported seeing a UFO in the state in 1969. In a later 2007 CNN interview, Carter said, “It was unidentified as far as we were concerned, but I think it’s impossible in my opinion to have space people from other planets or other stars to come to us.” He also described that the light in the sky changed colours, moved rapidly, and disappeared after ten minutes. During his 1976 Presidential campaign, Carter promised to make all documents on UFOs available to the public if elected. But, he did not. During a 2007 presidential debate, NBC’s Tim Russert referred to a passage from Shirley MacLaine’s book, Saging While Aging, in which she stated that candidate Dennis Kucinich had seen a UFO while visiting the actress in her Washington home. The former Ohio representative confirmed that on live television, comparing his experience to Jimmy Carter’s. On the Tonight Show with Jay Leno, actor Aaron Eckhart, currently starring as a US president in London Has Fallen, shared that while doing press for ‘Battle: Los Angeles’ in 2001, he and a group of friends witnessed a strange red and green light travelling across the New Mexico sky “at speeds that were not human”. Leno’s next guest, super model Christie Brinkley, wanted to share her own UFO stories and recounted a sighting she’d had in Cyprus. In 2011, Steven Spielberg confirmed his interest in UFOs when he said that the movie E.T. was originally based on a famous UFO sighting and alien encounter in Kentucky in 1955. Scientologists believe in aliens and UFOs, based on the concept of aliens seeding and populating the Earth. Tom Cruise in 2007 was reportedly building a multi-million dollar bunker at his Colorado mansion as a precaution against an alien invasion and takeover. Actor Glenn Ford, staying at a Southern California beach-house in 1974, observed two large discs over the Pacific Ocean for a few minutes before they flew off at a ninety-degree angle. Elvis Presley never saw a UFO proper, but claimed that as a child he met “beings of light from the Blue Planet who showed him future images of himself onstage as a famous performer.” Presley also claims on the night he was born that a beautiful blue light shone over his home. Warren Beatty, in New York the night of the famous widespread blackout of 1965, once claimed to have seen a UFO hovering over the city. And, who knows, maybe aliens did cause that blackout. But once again, it’s time to close those creaky doors …. See you then, next month, with another tale from the Hollywood Trivia Closet…. Welcome to the first segment of the Hollywood Trivia Closet on The Ultimate Movies Broadcast Show. This week’s feature tale takes a peek back at actor Errol Flynn the Tasmanian hunk – before becoming world famous. 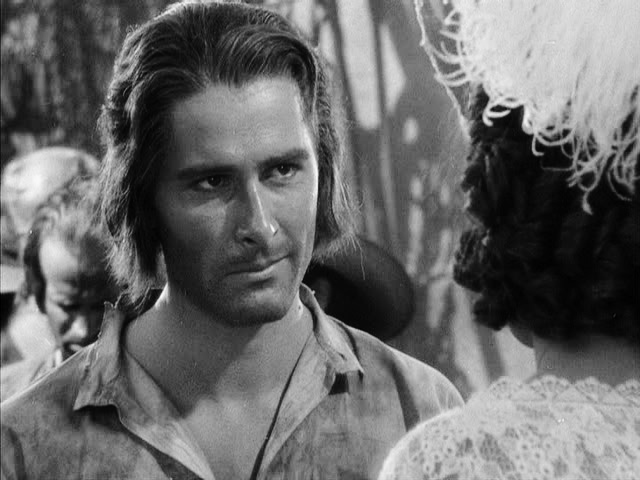 In 1933, Errol Flynn had made a brief splash as Fletcher Christian in Australia with The Wake of the Bounty, but he soon found himself looking for work off-screen. With the tough times of the Great Depression, a number of odd jobs helped to pay the bills, and in an impulsive moment, he also stole his mistress’ diamonds. He dug wells for awhile in Diamond Downs in Queensland, Australia’s interior, and then he joined a mate to work 80 miles away on Stirling’s ranch, which could herd up to 100,000 sheep. Can you even imagine 100,000 sheep? For this job, Flynn found himself as second lowest man on the assembly line – of gelding young rams. How exactly did this work? you may ask. Well, The first man had to clear away the mess from the ram’s posterior. Flynn would then take the ram, hold it upside down, and with the precision of a surgeon, cleanly bite off its walnuts with his teeth. The procedure was commonly known to Australian farmers as “dagging the boggets.” By the end of the day there would quite a collection of Ozzie prairie oysters. The job went without mishap for awhile, although Flynn could never quite totally wash off or cover up the smell of he-goat completely. Admittedly, his dating life suffered a bit for that, yet he wasn’t deterred long from seeking out a suitable filly, one closer to the scents hanging around the ranch. But Flynn couldn’t balance the job with his love life. He was officially run off the ranch when the owner discovered him with one of his daughters in her bedroom. According to Flynn’s autobiography, My Wicked, Wicked Ways, while the owner went in search of a shotgun, Flynn grabbed his clothes and his hidden diamonds from that previous mistress, and high-tailed it. Not much later, a gold claim he’d once put in with a partner would be granted, but that’s another story for another day…. See you then, a month from now, with another tale from the Hollywood Trivia Closet.